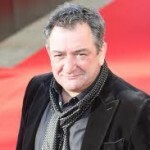 Acclaimed actor Ken Stott cuts a tough and uncompromising figure on screen as DCI Red Metcalfe. But he would be the first to admit that he is no action man. So, when the Edinburgh-born star was faced with an heroic rescue on MESSIAH 2 – VENGEANCE IS MINE, he had just a flicker of doubt. in the can,” he jokes. “Red has to go into a storm drain, down the metal rungs to the bottom, where there is a girl – bound and gagged with the water rising. “I confess I was a bit apprehensive. 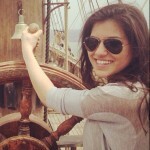 But I had to rescue a very attractive girl, Dani Biernat, not a big hairy bloke so that was a bit of an incentive! Also, the scene was shot at a water sports complex somewhere in Enfield and the water was almost as warm as a bath. Even so, Ken found his underwater experience quite an acting challenge. “I’m not Esther Williams, I can’t do smiling and winking at the camera while under water,” he says wryly. Which is not a state that the audience for MESSIAH 2 – VENGEANCE IS MINE should anticipate. The new two-parter is as gritty, gory and Gothic as the first and Ken believes it is following a fine tradition. “It’s the world of Brothers Grimm and Shockheaded Peter, stories that are designed to make children scream,” he explains. That is why Ken was happy to explore the character of Red Metcalfe further, to stretch his emotions and his reactions to extremes. “Within that is the reason for doing it – there is something within us, some need to tell ourselves that we are comfortable. We see things that are scary and then feel lucky to be where we are! But it would be very easy to lose sight of the humanity of these people. We are surrounded by action, blood, gore and because it’s story-led it is very important that we capture a character. I just wanted to say a huge thank you for all your help yesterday. It really was a privilege to work with you. Having you there was amazing, I felt so comfortable and safe the whole time- you literally had my back! Hope to work with you again in the future.